The proposal to expand the Taungalay new town housing project in Sanpree village tract, Hpa-An Township got the green light from the State Parliament on April 3. 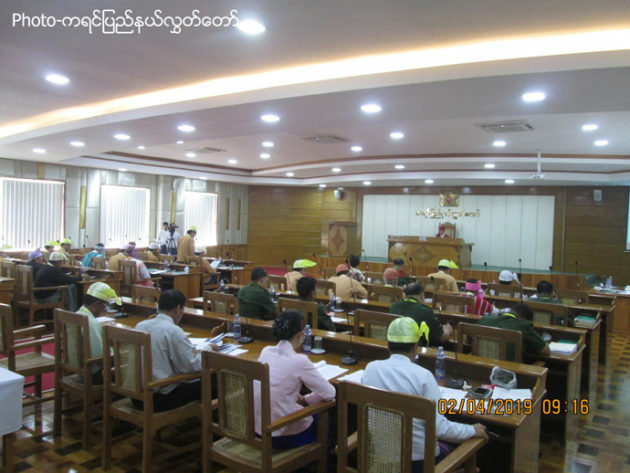 The proposal by U Than Naing, State Minister of Project, Finance and Municipal was raised during the first day of the 10th regular parliament session on April 1st, 2019. Minister U Than Naing said the project will benefit local people, workers and civil servants in the area. The designated land area of 928.93 acres used for the new town initially belonged to Burma Army Division #22’s Headquarter. The army transferred the land back to Hpa An District administrator U Hsan Maw on June 2018 after the Minister of Interior announced the land is owned by the State on April, 2018. The Taungalay new town housing project committee, the body which will take the lead in running the project, was formed on November 20, 2018. The 928.93 acres of land will be divided into categories that includes 416 plots of 60’ x 80’ square feet that taken up land areas of 45.83 acres, 5,602 plots of 40’x60’ square feet that taken up 308.11 acres of land, 100 acres for high standard housing, 274 acres for roads, 8 acres for school and government departments’ offices, 6 acres for cemetery land, 22 acres for religious lands and another 203 acres for a nearby village, San Panoe village’s land areas. Several companies including India’s SMH Industrial Service Co. Ltd, Burma’s Golden ZENITH Construction and Chinese companies have shown interest in joint venture with the State government on the new town project. The current land areas of the new town previously had overlapping land allocation with the Karen National Union, and is still being negotiated – villagers who had bought land from the KNU are concerned over their rights to the land. U Hsan Maw, Administrator of the Hpa An district said they will find ways to make restitution for villagers’ losses. Previously, the government used force to dismantled buildings and fences made by land owners who had bought their land from local KNU officials. Some locals affected by the government’s tough actions are not happy and demand transparency on the project’s implementation process. The expansion of the Taungalay new town housing project was proposed by the Karen State government to a Union government committee and the approval from the President was secured on 30th October, 2018.